Scuba diving is used for scientific projects such as plant and weed surveys, fish counting and investigation of aquatic life. 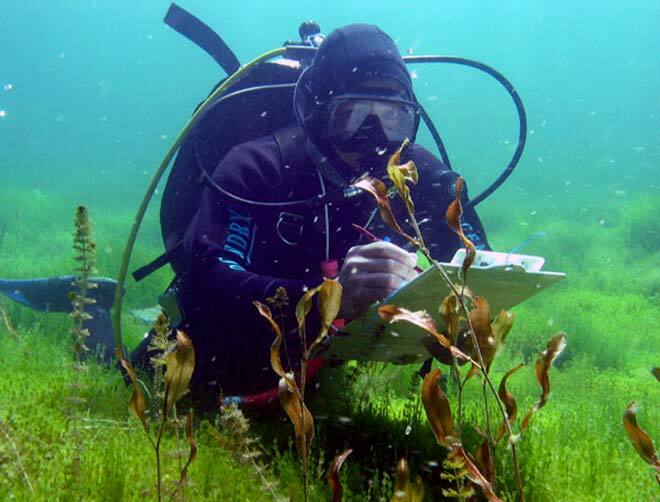 This diver from NIWA (the National Institute of Water and Atmospheric Research) is recording macrophytes (underwater plants) in Lake Waikaremoana. Such plants, if they become invasive, can overwhelm native species and threaten the diversity of the lake habitat. An increase or decrease in numbers of macrophytes can also alert scientists to changes in water clarity.